When your closet door is made from 150-year-olde pine retrieved from a Maine barn, it tells special story about you and your home. Dan in Peabody, Massachusetts was rebuilding his home and wanted a fashionable barn door for a small closet near the main entry. 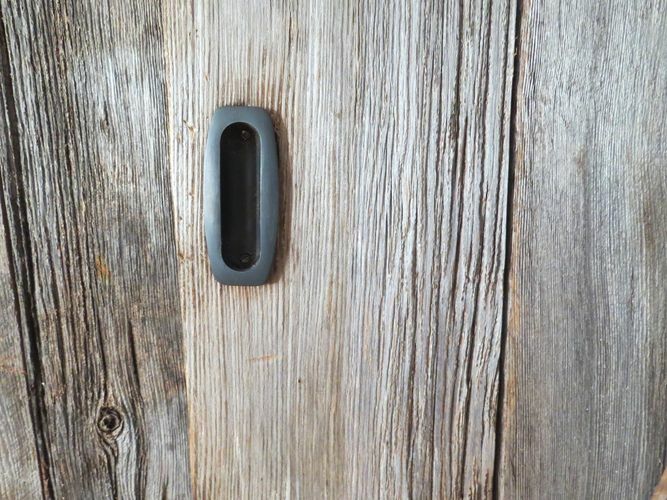 Using darker gray wood that would match other interior stylings, The Barndoorist created the classic "Z" style door and used part of a cut rail to create the long door handle. Also, a large metal wheel at the base serves as the "stay roller" or guide wheel that keeps the door from swinging outward as it moves. These rollers are commonly used to keep doors 'on track' and gliding smoothly. They have been made from various sized caster and pulley wheels, and installed in a variety of ways. This one uses a large "L" bracket that mounts to the baseboard trim behind the door. Steve in Portland, Maine wanted a bypass door system made to cover his kitchen pantry. Bypass systems are where one door passes in front of the other and so both doors are on separate, parallel rails. Custom brackets were fashioned by The Barndoorist, which is a title that Steve actually came up with while watching these doors being installed! The wood is 150-year-olde pine retrieved from a Maine barn, which fits perfectly into his home and where he is from. "Sides" added to these doors to lessen any gap between each door and the trim around the pantry entry. Sides are fashioned on site once doors are hanging because every project is different, but The Barndoorist is all about details. 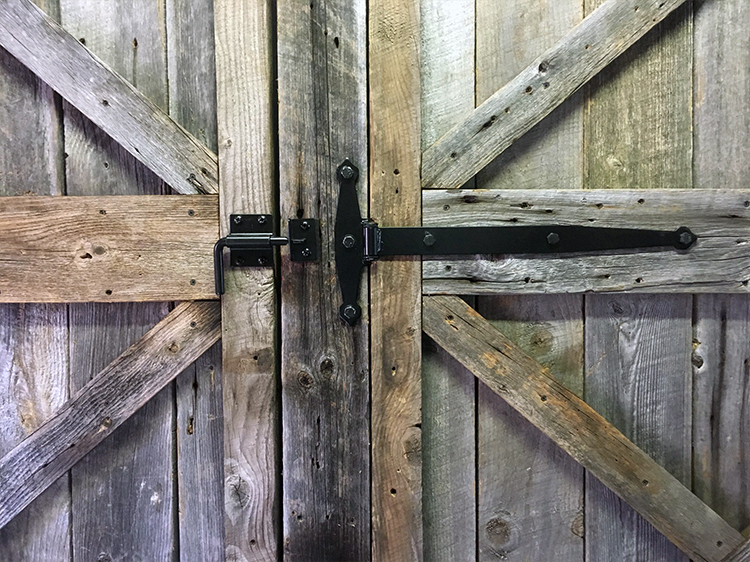 Nearly every door made has had sides added, but it doesn't seem that anyone else who might slap a door together cares to plan for them, so if you want a well made, thorough barn door, know that Northshore Barn Doors pays attention to these things and they matter. In the early days of Northshore Barn Doors, Steve from Essex, Massachusetts asked to have a cabinet style barn door unit made to cover the large space on his family's high ceiling living room where their TV and entertainment center would soon go. 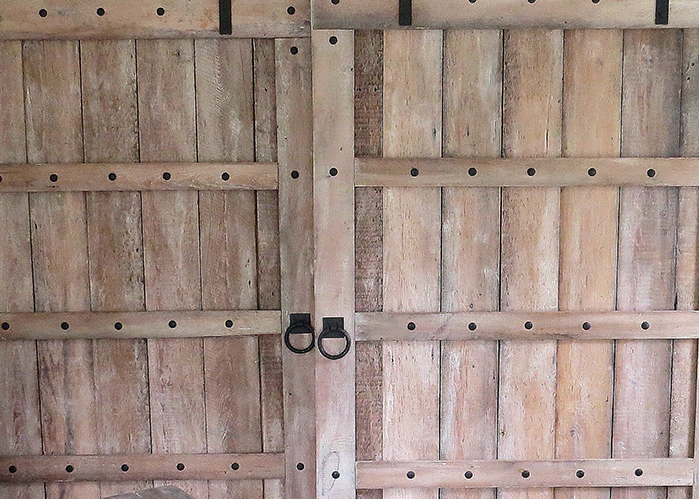 Special large brackets had to be fashioned in order to hang the two heavy doors nearly a foot out from the wall so they would cover over any mounted equipment and glide smoothly. These steel brackets are coated in rustic black to match other metal used on the doors and are held in place on a large, long header that is bolted to the wall. Looking like a giant barn beam, the header is over 10 feet long. 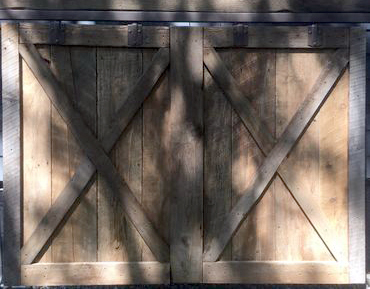 Such headers are used in many sizes and styles for nearly all barn doors The Barndoorist installs.